FOR IMMEDIATE RELEASE – Stamford, CT – Saint-Gobain North America, a $5.8 billion global building materials manufacturer, was given the Corporate Citizenship Award by Chief Executive Group for its partnership with YouthBuild USA, its efforts in helping to educate and train disadvantaged youths. The event took place at Chief Executive’s CEO2CEO Summit, at the Apella Alexandria Center in New York City on Thursday, December 7. For the last seven years, Saint-Gobain and YouthBuild have provided young adults with the training and skills needed to secure careers in the manufacturing and construction industries following graduation from the program, providing them with a productive path forward while helping Saint-Gobain fill its pipeline for skilled workers who are trained to install/work with their building materials. In addition to funding, the partnership includes a commitment to providing energy-efficient products, building science and technical expertise and employee volunteer support. Through this partnership, thousands of students’ lives have been transformed, more than a dozen sustainable renovation projects have been completed. This year, employees were given three volunteer days to work alongside students. The program has expanded internationally, and Saint-Gobain recently opened the Saint-Gobain YouthBuild Academy in South Africa. Stanley Bergman, chairman and CEO of Henry Schein, and Chief Executive’s 2017 CEO of the Year, presented the award. Carmen Ferrigno, Vice President of Communications, Branding and Philanthropy and Executive Director of the Saint-Gobain Corporation Foundation, accepted the award on behalf of Tom Kinisky. Chief Executive Group is the leading community for business leaders worldwide. 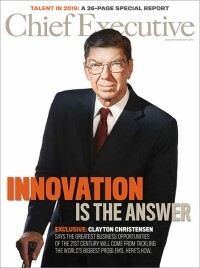 It publishes Chief Executive magazine (published since 1977), chiefexecutive.net, Corporate Board Member and boardmember.com, as well as conferences and roundtables that enable CEOs to discuss key subjects and share their experiences with their peers. The Group also runs the Chief Executive Network, the leading CEO membership organization arranged by industry, and facilitates the annual “CEO of the Year,” a prestigious honor bestowed upon an outstanding corporate leader, nominated and selected by a group of peers. Visit www.chiefexecutive.net for more information.